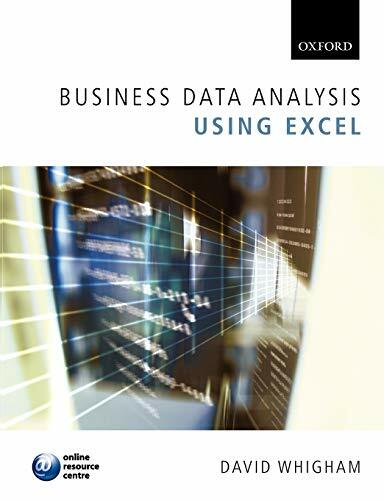 [PDF] Business Data Analysis using Excel | Free eBooks Download - EBOOKEE! Description: Taking a thematic approach to the use of Excel spreadsheets in introductory business data analysis, this text has been designed to explain the overall nature of what is to be achieved and also instruction in how it is to be done. The learning approach is highly interactive and enables students to develop an understanding of the power of Excel in allowing both analysis of business data sets and in the flexible preparation of graphs, charts and tables for inclusion in reports and essays. The text is supported by an online resource center with self-marking exercises that can be used by instructors for formative and summative assessment, and a series of PowerPoint files containing all of the illustrated worksheets and figures. 2017-11-10[PDF] Learn Business Data Analysis with Excel in under 5Hrs. No comments for "[PDF] Business Data Analysis using Excel".